When I was little, I used to adore Neopolitan Ice Cream. My mom used to ask me if I'd like some "Van-Choc Straw" ice cream, and I did...I admit to eating more of the chocolate part than anything, but I appreciate the beauty of the combination now. Take. 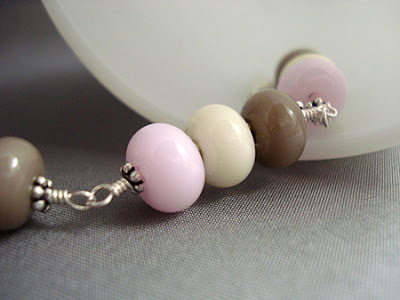 for example, the combination of colors in this beautiful bracelet featuring lampwork beads from Bad Cat Jewelry on 1000 Markets.